→How Does Barometric Pressure Affect Fishing? When you’re looking for the best times to fish, knowing how the weather can affect fish behavior can be useful. Barometric pressure is one factor that can have an effect on fish, and if you understand how it works you may stand a better chance of reeling in that catch. But we know it can be confusing, which is why we thought we’d put together a short guide to explain what it is and how it might affect your fishing. So, What Is Barometric Pressure? Also known as atmospheric pressure, barometric pressure is essentially the force created by the weight of the air. Barometric pressure is determined by the temperature on the surface of the Earth and by the movement of the atmosphere, which can cause both low pressure and high pressure. You will have probably seen or heard, during weather forecast reports, of the effects of low and high pressure systems. High pressure is usually responsible for calm, dry and clear weather and low pressure, on the other hand, is responsible for wet, windy and cloudy weather. Air tends to move from high pressure areas to low pressure areas, which can then intensify the weather conditions in the low pressure zones, as extra air is pulled out of the surrounding high pressure zones. The higher the pressure, the more hold the atmosphere has, whereas the lower the pressure the less hold it has and therefore the clouds and bad weather will drop closer to the surface, creating unsettled weather. Low and high pressure systems move around the world as temperatures and other factors change, which means there’s a cycle of changing pressure systems. Warning: here's the geeky section! You might have noticed that there are several units of measurement that can be used in order to record barometric pressure. Meteorologically, you might find the pressure recorded as millibars (mb). However, it may also be recorded in hectopascals (hPa), which is the official unit of measurement of the World Meteorological Organization. The conversion between millibars and hectopascals is the same, so 1000 mb is equal to 1000 hPa. On the other hand, in the US, you will likely also see barometric pressure recorded in inches of mercury (inHg). This can be a commonly used measurement of pressure on weather apps on your phone, if you’re in the United States. If you’re elsewhere, however, pressure will often be listed in hPa. Standard pressure at sea level is often considered to be 1013 hPa or 29.92 inHg. Any reading that is higher than this level is considered high pressure and and anything below this level is regarded as low pressure. How Would It Affect Fishing? Just as atmospheric pressure can affect the weather, it can also affect the fish. Since the barometric pressure is the force of the air at sea level, you may not think it would affect life under the water. But some fish can sense the change in atmospheric pressure due to the change in pressure in their organs. However, you may find you could have a more successful fishing trip when the pressure is in the middle of changing. Fish will often be more active during the shifts in atmospheric pressure. This means they will tend to feed more both just before the arrival of a storm and just after it has passed, so as the pressure on the barometer is either falling and rising. If the barometer shows a drop in pressure after a period of high pressure, this can be a good time to fish with faster bait, as the fish will likely be prepared to chase it down. 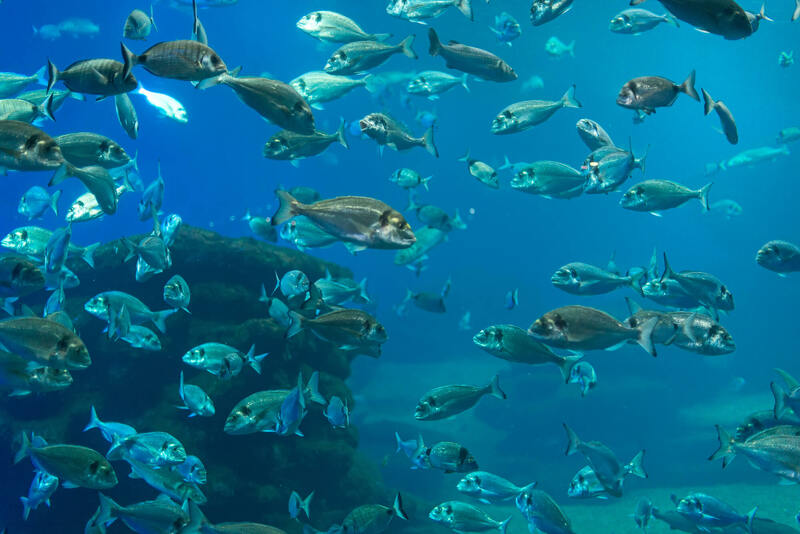 During this period, the fish will often be actively feeding before the onset of the low pressure because they will usually be less able to feed when it arrives. However, you might find that as the pressure starts to rise just after a bad storm, the fish may take some time to adjust to the rising pressure, meaning they may not start feeding again until around 24 hours after the storm has passed. Certain species, such as a variety of offshore species, may not always be affected by the change in pressure. Yet, their behavior may be affected because of the prey they eat. Therefore if their prey sense a change and head to deeper water, it’s likely that the predatory fish will follow. Fish are believed to experience the change in barometric pressure through their air bladders. The change in pressure can cause them to move into deeper waters in order to alleviate their discomfort and balance out the pressure. Think about when you’re in an aircraft and the pilot adjusts the pressure in the cabin as you ascend so that everyone on the plane can keep breathing and stay alive. Similarly, although without the technology, fish swim to deeper areas which adjusts the pressure on their air bladders. During extended periods of high pressure, where the weather is calm and dry, can mean your fishing success could depend more on your technique rather than the behavior of the fish. It can also be useful to consider other factors during times of stable pressure. Factors such as currents, lunar phases or wind direction, can often be used to predict where the fish might be found, particularly if atmospheric pressure isn’t having an impact on their behavior. The stable conditions brought about by high pressure can be ideal fishing conditions if you’re in a kayak or small boat, as the water should be relatively calm and there shouldn’t be any dangerous storms on the way. However, you may still find that fish will tend to be in deeper areas or hiding out near structures and may not be as active as during a fall in pressure. During periods of low pressure, fish will often tend to hide out in deeper areas of the water to wait for the storm to pass. This means that your success rate may not be as high, as the fish are generally not actively feeding. If you’re fishing during the peak of a low pressure system, it might be a good idea to use slower moving bait if you’ve found where the fish are hiding. While you may now have a catchy Queen/Bowie song stuck in your head (sorry for the cringe title! ), hopefully you’ve also learned how barometric pressure can affect your catch rate. Remember, as the pressure starts to fall, just before a storm arrives, this can be a good time for fishing, as the fish will generally be feeding before making their way to the deeper waters. Similarly, a day or two after a storm has passed can also be ideal for fishing, when the fish will start to move again. Have you had to alter your fishing techniques due to barometric pressure? Leave us a comment to let us know and remember to share this with your fishing buddies.